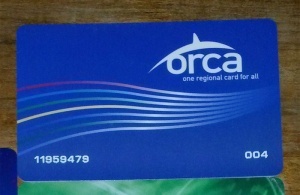 ORCA (One Regional Card for All) is a smart card fare-payment system for the Puget Sound region. As a smart card system, ORCA cards are capable to store cash (stored transit value) and passes depending on agency. Riders can use the same card to transfer between different operators. With pass and funds in e-purse, the card can automatically pay the fare difference beyond what the pass covers. Riders can purchase passes online. By registering the card, a rider can recover the pass or value in case of the card is loss or stolen. $5 replacement fee is required. Special ORCA cards for seniors and disabled (also known as Reduced Fare Permit) allow discounted fares to be charged. Submit a completed application to any of the participating agency. Cost is $3. Youth (age 6 to 18) requires proof of age. May be ordered by mail. Card cost is $5. If you choose to add value through the web site, it would take up to 48 hours for the values to show up on the reader. Simply tap the card on the ORCA reader onboard buses or at stations and hold it for a beep. This page was last edited on 4 March 2016, at 13:58.